Victory! 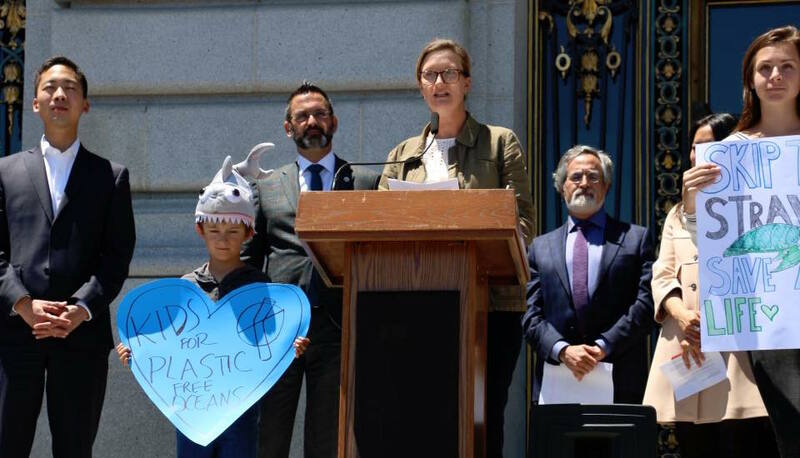 San Francisco passed the Plastic, Toxics and Litter Reduction Ordinance this week in response to the outcry against marine plastic pollution. After three years of groundwork by the Surfrider Foundation San Francisco Chapter and allies to raise awareness and build a movement to reduce the use of single-use plastic straws, San Francisco has adopted an ordinance that will ban the sale and distribution of single-use plastic and bio-plastic straws, utensils, stirrers and similar items, in addition to foodware containers that contain fluorinated chemicals. The ordinance further requires that all single-use foodware and accessories must be compostable (accepted by the city’s composting program) or recyclable. Single-use plastic and bio-plastic straws have proven to be problematic forms of litter, especially in marine environments, as they do not break down. San Francisco will be among the first jurisdictions in the U.S. to adopt an ordinance on straws. Other jurisdictions with existing ordinances include Seattle and Edmonds, WA; Miami Beach and Fort Myers, FL; Monmouth Beach, NJ; and the California cities of Alameda, Carmel, San Luis Obispo, Davis, Malibu, Manhattan Beach, Oakland, Richmond and Berkeley. One component of this ordinance that stands out from others is that it also prohibits the sale and distribution of straws and stirrers made of bio-plastic. It’s widely known that petroleum-derived plastics do not biodegrade and instead persist for extended periods of time in our environment, including at sea. Similarly, bio-plastics fail to fully biodegrade in the natural environment, as they require processing by an industrial composting facility. A study by the 5 Gyres Institute that tested biodegradability in aquatic conditions shows that bio-plastic straws made from PLA (a plant-based plastic) did not substantially degrade in a 24-month time period at sea (5Gyres, 2017). With the increase in consideration of local straw ordinances, concerns have been raised about straw bans from representatives of broader communities, including people with disabilities. Surfrider believes that every law should allow for accommodation for those in need, and we intend to encourage municipalities and states to reach out to potentially affected communities, including people with disabilities, when writing the local ordinances/state law. In San Francisco, the plastic straw and plastic foodware ordinance states the following: Sec. 1606(c) “Strict compliance with this Chapter 16 is not required in instances where it would interfere with accommodating for any person’s medical needs.” The Surfrider Foundation wholeheartedly agrees that anyone who needs a straw should absolutely be able to obtain one and Surfrider supports and encourages outreach to the disability community during the drafting and implementation of this ordinance and other similar local efforts around the nation. So what’s next for the Surfrider Foundation San Francisco Chapter? For more about Surfrider Foundation’s efforts to reduce plastic straw waste, click here.